Face it, shopping for eyewear is about as fun as going to the dentist…. Let’s face it, shopping for glasses is ranked as high on the not to do list as going to the dentist. For years I have seen people walk into our store with a look of dread, their face says it all… it’s time to get new frames, but they are dreading it rather than looking at it as a makeover. The primary reason I hear people say in regards to not looking forward to picking out new glasses is that they have a hard time figuring out what looks good. And lets face it, it’s discouraging to try on frame after frame and not like any of them, there’s just something that’s not quite right, but you cant put your finger on it. The same frame you think looks dynamite on your friend or neighbor looks horrendous on you…. why is that? One way to expedite the process and find frames that will look good immediately is to first figure out what your face shape is, and then learn what shape is most flattering for your particular face shape. 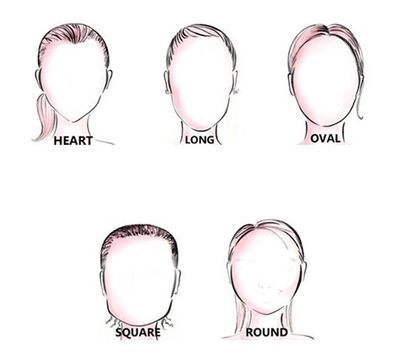 The following are a few types on deciphering your face shape and what will compliment you! Heart shaped faces look good in many shapes and styles. This face shape is the most versatile. The key is to find shapes to balance the varying widths of their faces. Find frames that add width and detract from the length of the face; frames with an accented browline work great. Deeper lenses help balance out length and shapes with rounded edges or curved lines soften the angularity of the face. Avoid small, narrow lenses that will exaggerate face length. Oval face shapes are versatile so long as scale is kept in mind. Frames that are too big too small will throw off the natural balance of the face shape. Oval face shapes work best with square and rectangular frames to contrast curved lines. The goal is to contrast the straight, bold lines of a square face. A softer oval shape softens features. When trying on rectangular frames, look for softened edges; avoid sharp corners. Round faces are all about curves, and are the perfect showcase for strong angular shapes. Look for frames that have a slight upsweep at the corners to enhance those great cheeks and bring focus to the eyes. Also, try looking for frames that are wider than they are deep.